Yesterday, the International Contact Group on the DR Congo met in Stockholm. 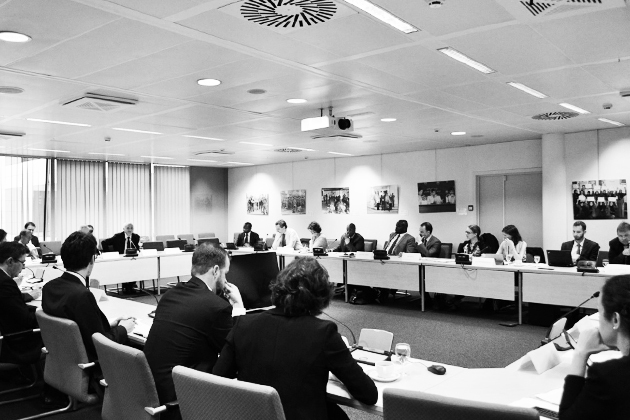 It’s a regular meeting of the body, which includes most major donors involved in the Congo––US, UK, Belgium, Germany, France, EU, Sweden, South Africa, and the Netherlands––as well as the United Nations. There is rarely any press coverage of these events, and their conclusions are almost never published. All the more reason to take a look at the major policy issues at stake. First and foremost, the group probably discussed the possibility of targeted sanctions against members of the Congolese government. The US government has taken the lead on this––On February 4, 2016 Senator Ed Markey wrote a letter to the Secretary of State John Kerry, urging him to impose targeted sanctions against members of the Congolese government if they do not hold elections this year. A week later, at a congressional hearing, the US Special Envoy to the Great Lakes Tom Perriello went further, saying they were considering imposing sanctions even before next year “to hold accountable individuals who threaten the peace and security of the DRC and undermine its democracy.” Within the advocacy community, Human Rights Watch has been the loudest proponent of sanctions. It would be easy for the US government to impose such sanctions. President Obama signed an Executive Order in July 2014 giving his administration broad powers in sanctioning individuals who undertake “actions or policies that undermine democratic processes or institutions in the Democratic Republic of the Congo.” However, the US administration is not united on this question. Some old Congo hands think that imposing sanctions could have the opposite of the intended effect, radicalizing Kabila’s government and discouraging the president from handing over power. Others think that they can impose sanctions now, starting with people directly involved in repression––General Célestin Kanyama, the police commissioner of Kinshasa responsible for crackdowns in 2013/2014 and 2015, is a possible first target of a travel ban and an assets freeze. Secondly, there is the issue of what line to take on elections. It is becoming increasingly difficult––many say impossible––to hold decent presidential elections by the end of the year. The election commission says it will take 14 to 16 months just to revise the voter register, which includes hundreds of thousands of dead people, excludes millions of new voters, and was contentious even during the 2011 elections. While the opposition says that this can be done much quicker, and some are even saying elections should be held with the old, outdated register, the government has ignored these voices and is currently trying to launch a national dialogue with the UDPS opposition party. In private, even the UDPS says that there will probably have to be a significant delay to elections. But should donors let the Congolese government off the hook for delays that it helped orchestrate? After all, the voter register could have been revised last year if the election commission hadn’t been deprived of funding and if time hadn’t been lost in bureaucratic maneuvering. In March, the US and the UK both insisted that elections must be held in 2016. That line is becoming more difficult to toe––after his recent meeting with President Kabila, Secretary Kerry called for “timely” elections. The African Union and the United Nations said in February that elections should be held “à bonne date,” which is also open to interpretation. Several European countries are reluctant to ask “for what is impossible,” as one diplomat put it, and ask for elections in 2016. Diplomats I spoke with in Kinshasa last month––and even US government officials––suggested that a ruling by the constitutional court in favor of Kabila staying in power could indeed make it more difficult to impose sanctions. “In the end, it will depend a lot on whether the UDPS and the government has struck a deal. If they have, and the opposition is not united, donors will be likely the waffle,” one European official told me. Finally, the is the issue of the dialogue national. It has been over 5 months since President Kabila announced the dialogue, which was supposed to provide a way out of the current impasse. First, he asked the United Nations Special Envoy Said Djinnit to be the facilitator, but he was rejected by the opposition and the UNN itself wavered after it was told by the government that they would have to take on the job without any preconditions. Then, the African Union sent Edem Kodjo, the former Togolese prime minister, to test the waters and eventually, since April 7, to be the official facilitator of the dialogue. But Kodjo has also made several mistakes––first saying in January that he backs the dialogue without gaining the buy-in of much of the opposition; then on April 12 saying that the dialogue would begin that week (it hasn’t yet). Much of the opposition still rejects the dialogue. Here, however, there seems to be little difference within the Contact Group on this issue. It is more a matter of emphasis: how can donors back the dialogue while not endorsing the weak terms set by the government and without demobilizing the popular pressure that many believe will be necessary to push forward the political process? As usual, we won’t get any official answers from the Contract Group, so we will have to read the tea leaves of the official statements that come out over the coming months.